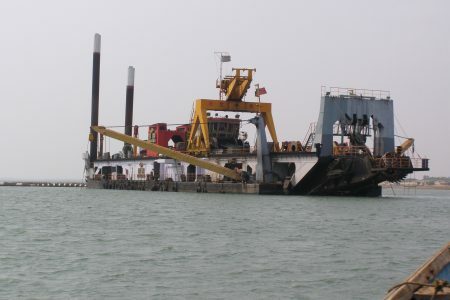 Capital Dredging & Reclamation Works at Krishnapatnam Port, Nellore, Andhra Pradesh..
Development of Port for export of iron ore and import of coal for power and cement plants..
Dredging at the mouth of Kandaleru river at Krishnapatnam about 26 Km east of Nellore. DDIL deploys newly acquired CSD Dharti XII (total installed capacity of 10780 KW) along with Dharti XI (IHC 6518), Dharti X (IHC 5014), Ta Lung and Ta Hsin (both IHC 1000 series dredgers) each individualy connected to set of floating and shore pipelines. Dredged material is transported to the reclamation area through pipelines situated at a distance of 2-3 Km from the dredging location. 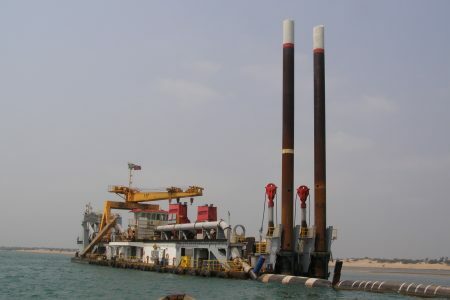 Phase I includes dredging quantity of 5.4Million M3. Phase II includes an additional dredging quantity of 2.1Million M3. The total 7.5Million M3 of dredging done at Inner channel, Turning Circle and Berthing areas to meet the initial design requirements. The aquaculture land identified for reclamation levelled and reclaimed with the dredged material by constructing internal bunds with wier arrangement for solid particles to settle and clear water to flow back to the original water body. All the material dredged by four dredgers consisting of medium to coarse sand with shell fragments was transported to the reclamation area which was planned to use for Stackyard, Transit sheds etc.,. Laying three different pipelines of sizes 500mm, 750mm and 850mm dia for length of about 2.5Kms on shore and 500m to 700 m floating. Total dredging quantity of 7.5Million M3 used for land reclamation to raise the ground level to a level of +4.00 CD by 10 Dozers and 8 Excavators.